RAR Password Recovery is a powerful WinRAR password recovery utility to recover lost or forgotten passwords for RAR/WinRAR archives. Unlock any password-protected WinRAR archive no matter what compression and encryption algorithm is used. Simply select your RAR file and wait for a few minutes while your password is recovered. No need to struggle to recall the lost passwords anymore. Recover lost or forgotten RAR/WinRAR passwords. Powerful RAR password cracker for recovering lost password for RAR/WinRAR archive. You got some Rar files, but they need a password. But you forgot what the password is. You have some encrypted RAR files which you made ages ago. You forgot the passwords completely. No chance of remembering them. And you'd like to have access to those files. You downloaded the RAR file from internet and apparently it is password protected. Is there a way to remove the password? "I have my private work compressed into a WinRAR file. I stored it and set the password, so that when my friends wanted to browse it, they have to get my permission first. But two days ago, I accidentally forgot the password! This is so really not cool. I couldn't afford to loose it. All my important files and particulars are all in there. With the help of RAR Password Recovery, I got my lost password eventually! Thanks very much for your awful password cracking software!!!" "I just forgot a crucial .rar password for a project. Your program helped me recover the lost password in just two minutes. Now I can open the WinRAR file again! Thanks very much!" "I have compressed some of files with WinRAR and gave a password since one year. Now I can't recall what it is. I got your product and it really worked! " 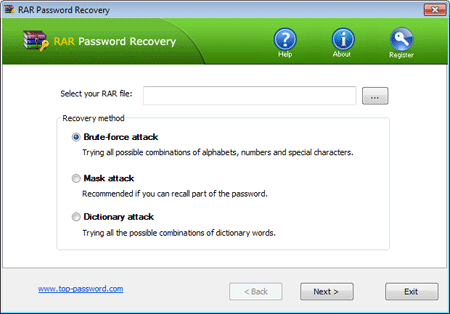 Learn How can you recover forgotten RAR password easily with RAR Password Recovery program.